Scrutiny of law enforcement agencies isn’t going away anytime soon, at least, not while unarmed citizens are shot and/or killed by police officers in this country. (Though you’d think that the cessation of the latter would top the agenda, since it would result in limiting the former.) 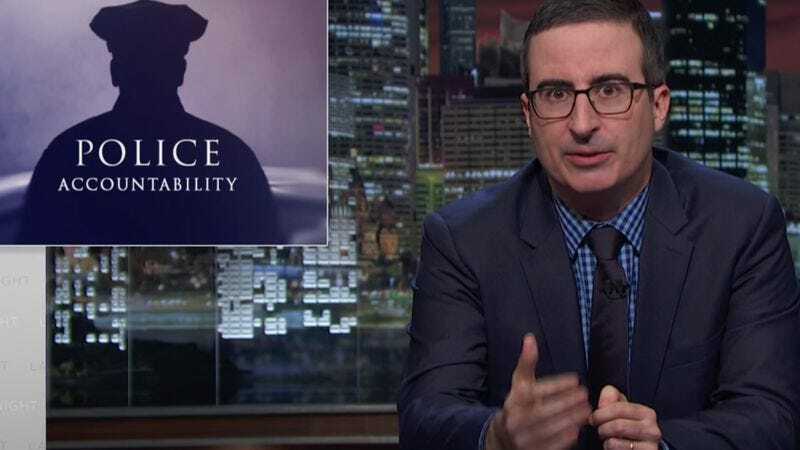 Last Week Tonight could probably devote its long segment to police shootings every week, but last night, John Oliver discussed the goal of all the ensuing protests—namely, police accountability. Like so many others, Oliver and his staff aren’t buying the theory of the few bad apples in squad rooms across the nation, especially considering the rest of that axiom predicts the ruination of the entire barrel. It’s also nearly impossible to determine just how isolated these events are, because while there are sites devoted to releasing weekly box office revenues, there somehow isn’t such a mechanism in place for compiling reports of police misconduct. Currently, we’re relying in part on Google alerts, which presumably won’t cut it when applied to the 18,000 or so police departments in the country.